Unlike gold and other commodities, equity and debt securities are not constrained by physical supply. 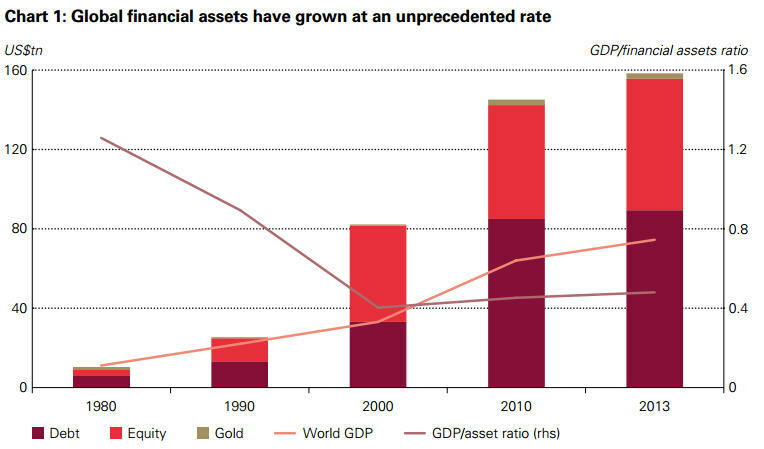 And without the need for physical backing, these financial assets have grown at an unprecedented rate over the past three decades. Here's what that growth looks like. Meanwhile, "gold holdings represent only 1% of all financial assets, despite a 12-year bull run," the analysts point out. According to the WGC, gold should make up a larger portion of portfolios in order to balance the risks of other assets. "[T]he share of gold in portfolios can sustainably increase and provide balance to a global financial system likely to experience more frequent tail events," the WGC wrote. "As a real asset, one that cannot be debased or devalued, gold is seen by many investors as a valuable risk management and wealth preservation tool. Gold supply is geologically constrained yet, once produced, is through a broad and liquid market." Read the full WGC report here.